I love decorating for Fall , almost as much as Christmas :) !! 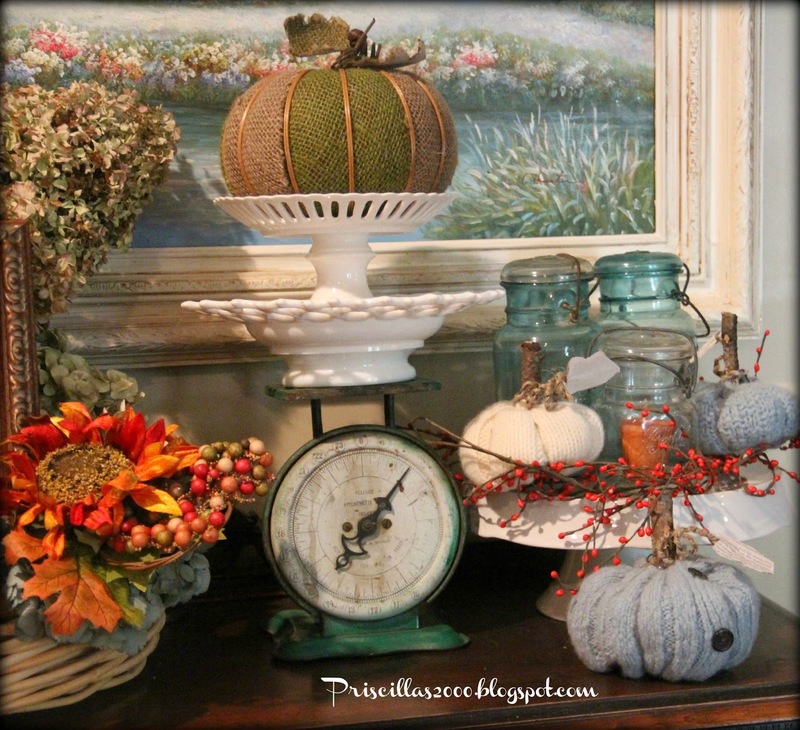 Today I am sharing the vignettes I have displayed in our family room for Fall.. I have this vintage buffet in my family room that was the first piece of furniture we chalk painted..The painting above it was found at a garage sale for $10.00 ,and I painted the frame ..it was gold.. I got the vintage scale for $5.00 at a church rummage sale this summer..I love the stack of footed thrited bowls with a pumpkin inside .. I have some vintage mason jars with candles in them surrounded by bittersweet garland and a couple sweater pumpkins.. 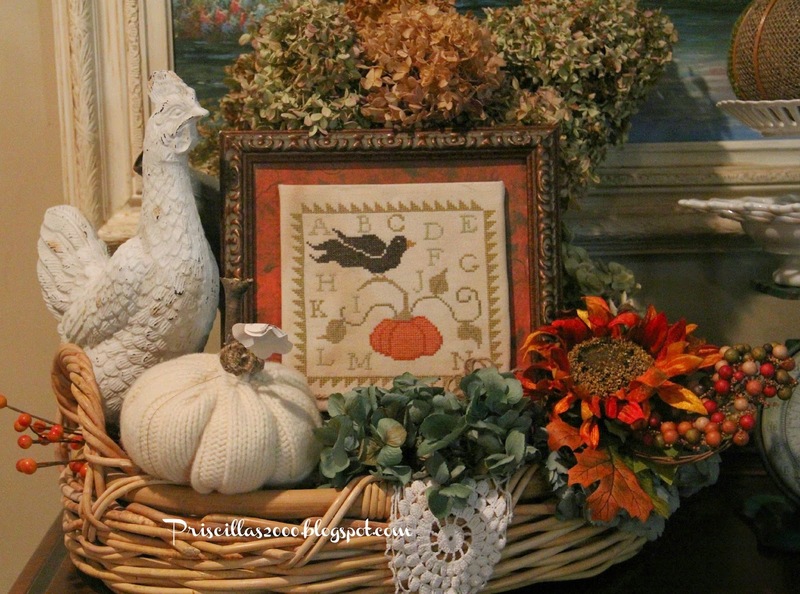 I love this big basket ( from Goodwill) and I added my favorite white chicken ( love chickens !) theres a vintage galvanized watering can holding the dried hydrangeas.. 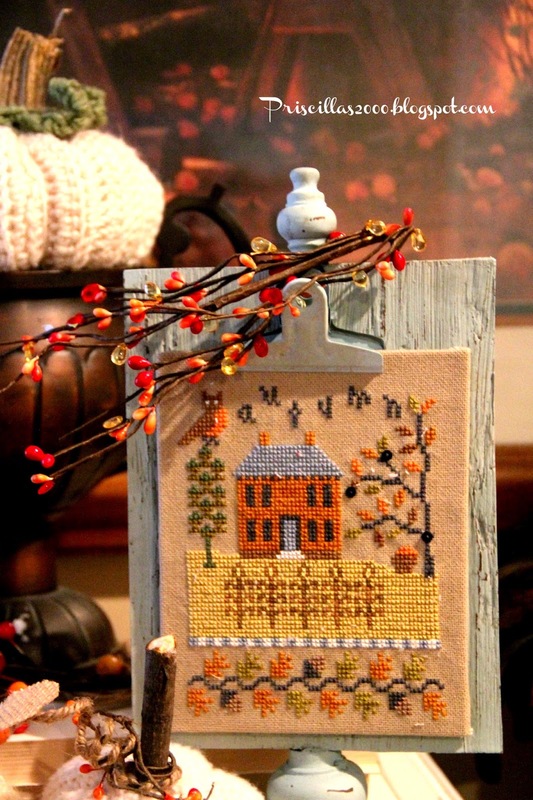 Leaning up against it is a Fall cross stitch I did last year from With thy Needle and Thread ..It is a free chart. More hydrangeas and a sunflower pick on top of a vintage crocheted piece . I moved my Septemebr stitching pieces to the desk and used this side table for more Fall goodies! 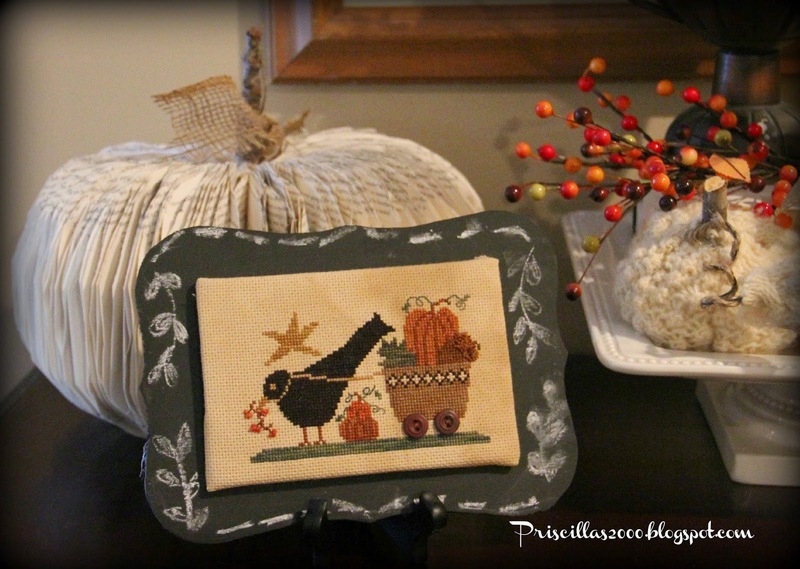 I finished stitching this Lizzie Kate Autumn stitchery and needed somehow to display it. I found this little distressed clipboard at Michaels .. Isn't it perfect ? I can't wait to stitch the other 3 seasons and just clip them on when its their turn ! I added a little berry strand to the top. I stitched this Homespun Elegance design last year also and mounted it to a wood shape I chalkboard painted. Theres a bookpage pumpkin behind it. I made some more sweater pumpkins to add to this table. I used sleeves from sweaters I had made pillows out of last winter. Love this crocheted pumpkin that I used a real dried pumpkin stem for .. 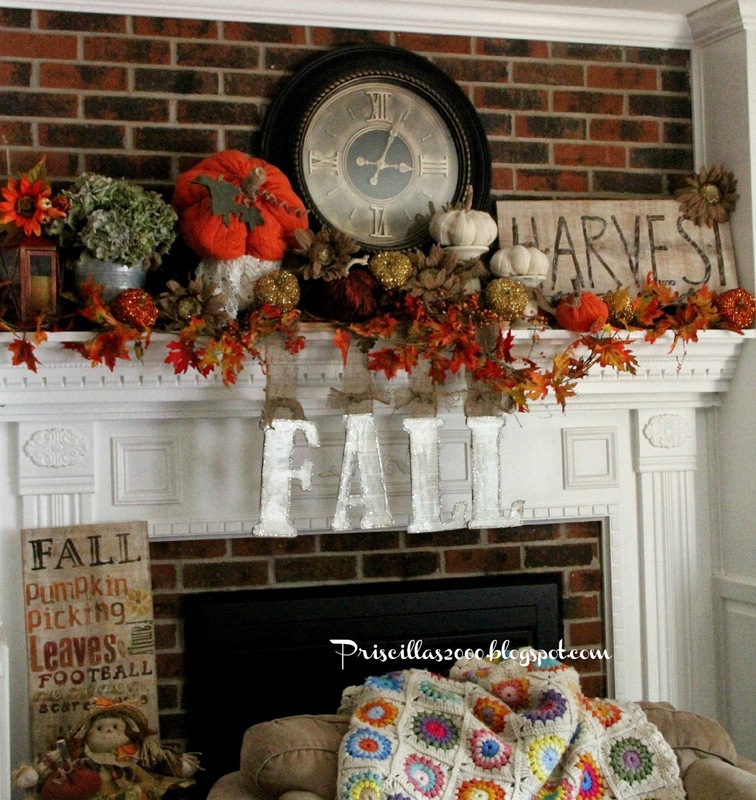 If you missed it yesterday , I shared the family room mantel decorated for Fall .. I want to be you when I grow up! You have the most original finishing ideas and I think they are fabulous. Gorgeous displays! Makes me want to pull my stuff out right now! Everything looks so beautiful! Beautiful!!! I love your decorating touch! Your Fall decorations are absolutely gorgeous. I love all your knitted pumpkins. The way you displayed your vignettes is so creative. Oh wow, I have to say that Fall in your house is in full bloom and totally gorgeous! I love your vignettes and Fall colors are the prettiest for me! I love it! We decorate so similarly! I use a lot of baskets and trays in my decorating. Now i just wish it would cool off!!! Wow, your Fall decorating is as beautiful as your Christmas decorating!!!! 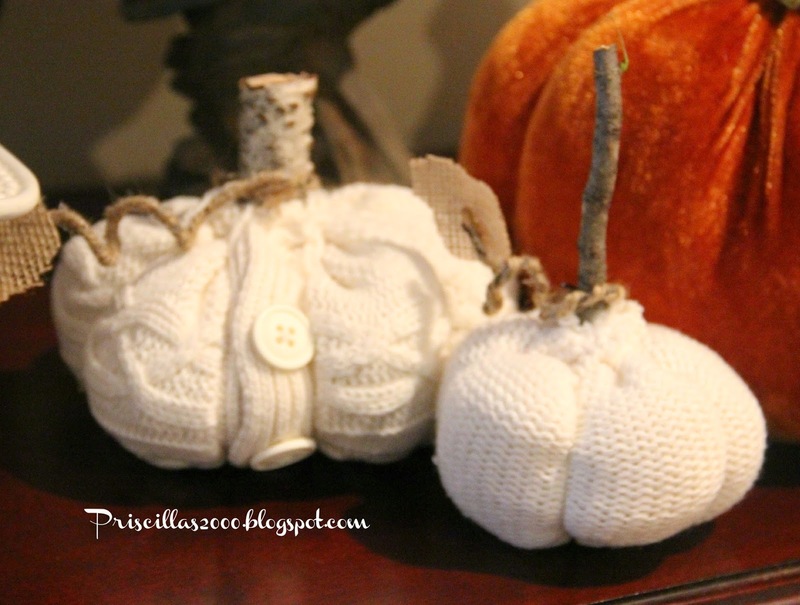 Love the sweater pumpkins, what a great idea, and they look fab!!! And the book page pumpkin, I bet that took ages to make!! You really have the best ideas!! 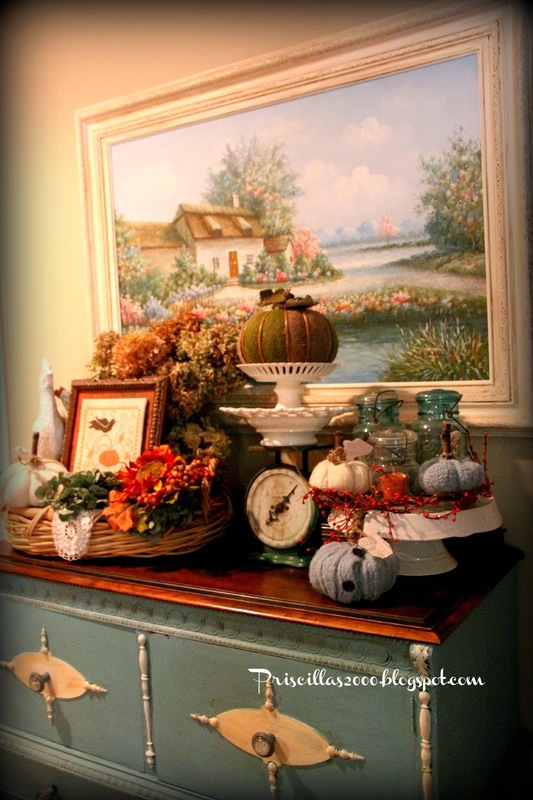 I've enjoyed visiting your family room with all of it's Autumn splendor..
Everything looks lovely. I've never made sweater pumpkins but have saved some dried "real" pumpkin stems.. Now I know what to do with them.. Goodwill is such a good place to find baskets, plates, roosters, etc. to use when decorating.. Thank you for sharing your lovely room. Your lovely home is all ready for Fall. It looks just beautiful!! You've done a wonderful job- love the different vignettes! That buffet is so cute in that color you painted it and that picture looks perfect with the color you changed it to. I've only done a couple of things for fall so far- I love seeing other people's creations! These are wonderful vignettes. I love the sweater pumpkins and the the creamy colors. Nice that you held back on the oranges and browns for a bit, since it's still early. Lovely transition pieces! 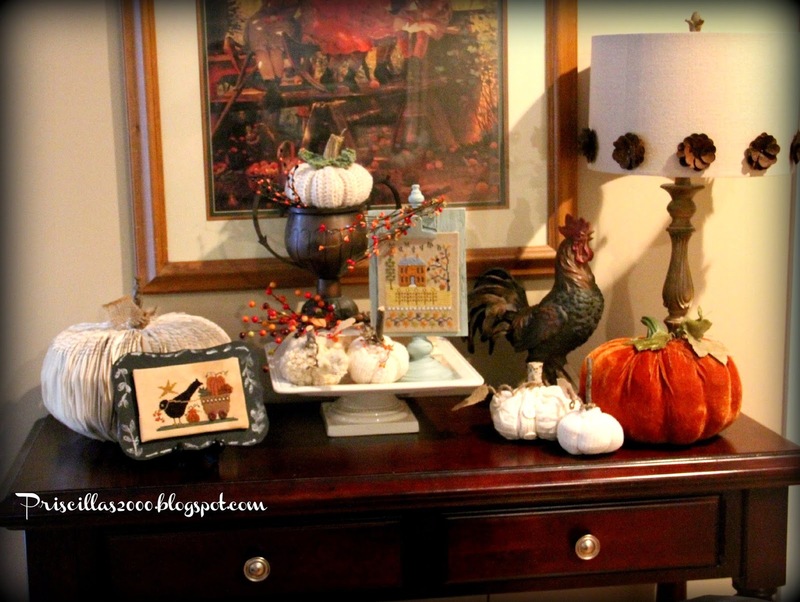 Love your vignette on the sideboard!!! The hues of the great thrifty print find are amazing duplicated within the vignette! I am swooning over your cross stitch works of art, dear one! I did an enormous amount of cross stitching during our Military years, but finished my last piece in 1989. Your Fall Mantle is gorgeous!!! Thank you for inviting us into your beautifully decorated home! Thank You for showing your home! Beautiful vignettes. I love, LOVE that scale and wish I could see the watering can:) I love Fall too!!!! 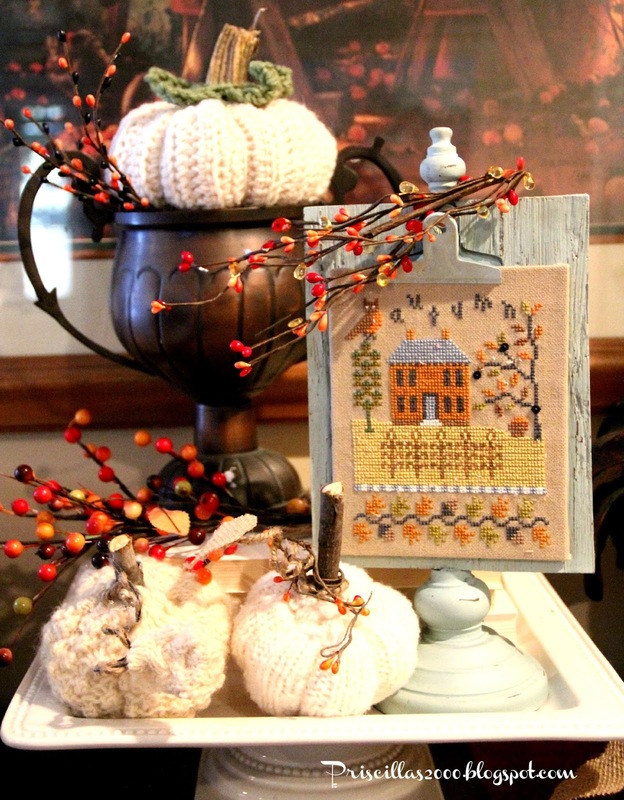 Wow your place is gorgeous love all the pumpkins but my favorite thing is your cross stiched clipboard. Great job! 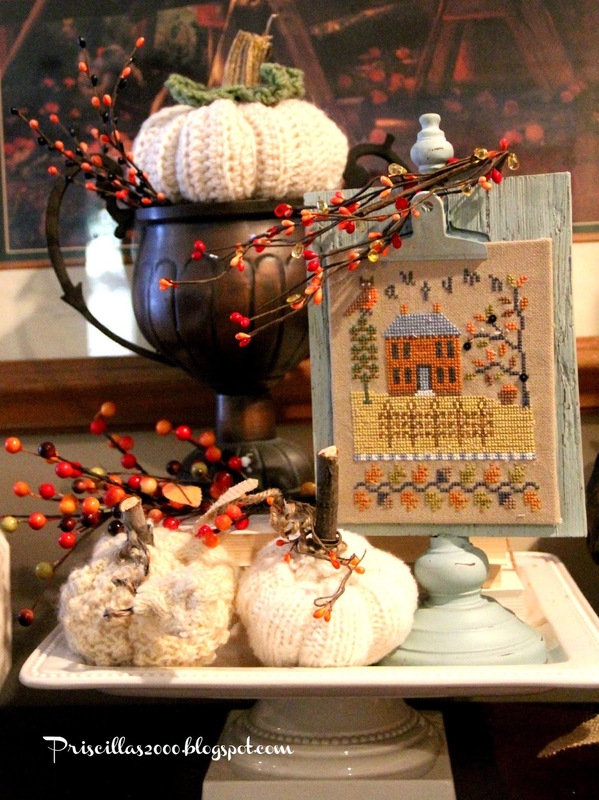 I love all your fall decorations, the examples of needlework, the way you set up your displays, everything, really! I want to come over and see it in person now. Wow! You are all ready for Fall! It all looks wonderful. 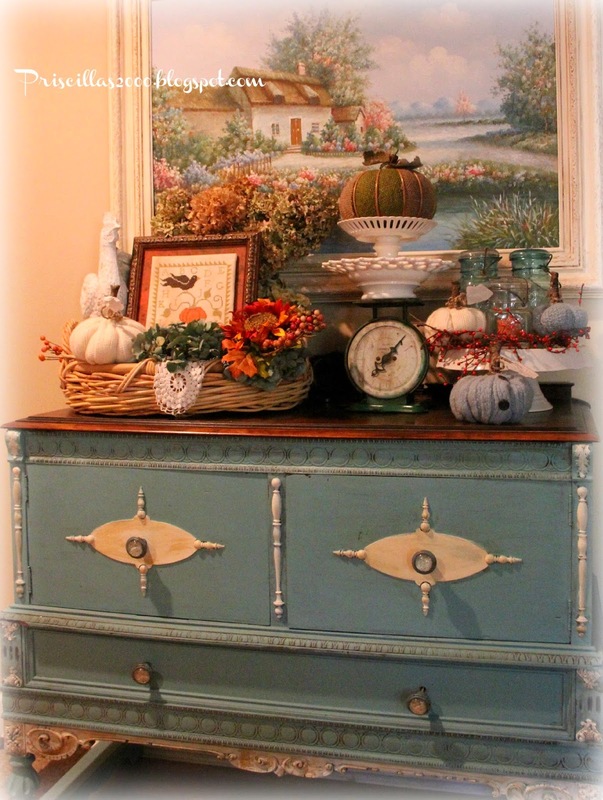 Priscilla, your gorgeous buffet is the perfect place for your gorgeous Fall vignette! Love it! Thanks for sharing with SYC. 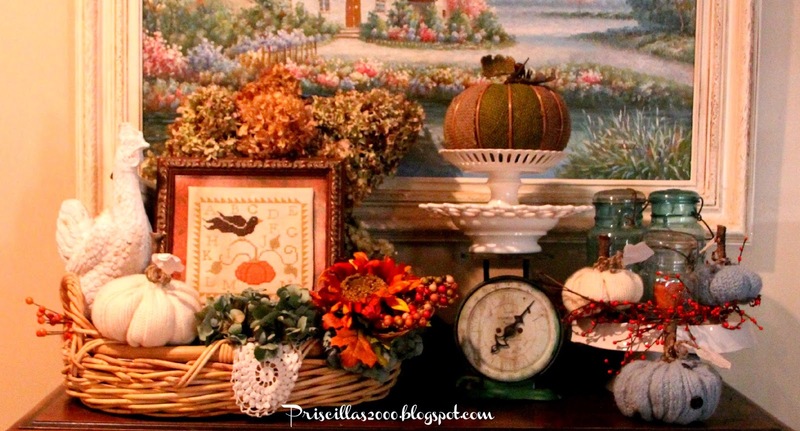 Love your fall vignettes! Thank you for sharing at THT.